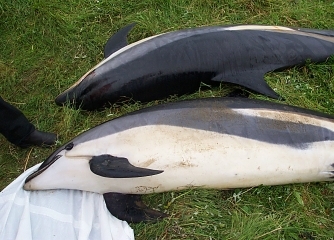 Yesterday morning, 30th Aug 2003, we were alerted about a live stranding involving 5 Atlantic white-sided dolphins at the head of Weisdale Voe in Shetland. SSPCA Shetland Senior Inspector Ronnie Patterson was first on the scene. Unable to speak to him at the time, we contacted Austin Taylor from the Shetland Sea Mammal Group for further information, and were later called by Karen Hall from Scottish Natural Heritage at the scene of the stranding. Whilst the breathing rates of the 2 animals were reduced remarkably and their condition stabilised somewhat by the vet and first aid team, with Kevin and Cameron providing online support, neither of the dolphins were showing any signs of being able to support themselves in the water. The pair were subsequently moved into shallower water where they could be tubed and rehydated with electrolytes and given antibiotics accordingly (it was not possible, in view of the immediate stranding area, to restrand the dolphins). On closer inspection, it was soon established that one of the animals was bleeding orally, and was also shown to be in a poor nutritive condition. On this basis, and that of the poor demeanour of the patient, the attending vet decided the most appropriate course of action must be to euthanase this animal. A sedative was given and the dolphin was put to sleep with an intramuscular injection of large animal immobilon. Meanwhile, the second dolphin was returned to deeper water. However, as it was being moved out to sea through the tide, it suddenly put on a swift spurt, surprising the rescuers and evading their grip. It appeared that the animal had in fact been successfully refloated to the team of helpers, and, cold and tired, they slowly dissipated and left the scene. Unbeknown to them, however, the animal in fact restranded on the opposite side of the bay. Ronnie and the vet managed to get to the stranded animal once again. This time, however, they were apparently very shocked by the obvious stress this animal was in, and a swift decision was made to end any further suffering of this dolphin. A single bullet was shot at a 45 degree angle through the blowhole of the infirmed dolphin from a 22 calibre rifle. It died instantly. In hindsight, we have been in touch with those concerned in the Shetland stranding via Inspector Patterson, and it seems that all involved have learnt much from the incident, but obviously feel they still have a lot to learn. The CRRU team have subsequently been invited to visit the Islands and offer their extensive experience to the organisations cooperating in this rescue. With the assistance of BDMLR, we hope to be able to better equip the islanders and ensure they have the best know-how possible for future strandings with appropriate public and veterinary training courses. We must say that this was a particularly valiant effort by all the individuals and organisations involved in this incident. The conclusion was not necessarily the desired outcome we all hope for in such an event, but it was a commendable response to the situation at hand, and a very fine example of co-operation between the Shetland islanders with the very best interests of the animals in their hearts. Special thanks this end to Cameron MacPherson for expert veterinary advice, Paul Jepson for backup support, and Allan Whaley for liasing with the RAF helicopter rescue team and putting them on standby. To learn more about the Atlantic white-sided dolphin, visit our "fact file" HERE. For more information on strandings or to download the CRRU's national strandings poster, with public advice and emergency contact numbers, click HERE.